This title is now out of print. A new version with e-book is available under ISBN 9780702044564. Promoting Health is a seminal text that has been used in the training and education of health promoters over the last 25 years and has shaped health promotion practice in the UK. 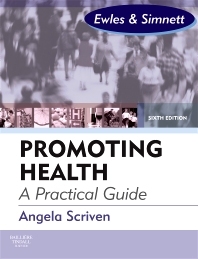 This 6th edition has undergone significant revision by a new author, Angela Scriven, a leading academic widely published in the health-promotion field, bringing it up to date with current practice. The text provides an accessible practical guide for all those involved in health promotion. Concerned with the what, why, who and how of health promotion, it is invaluable to students of the discipline. Angela Scriven is a Reader in Health Promotion at Brunel University in London, UK. She has been teaching and researching in the field of health promotion for over 30 years and has published widely including authoring, editing or co-editing the following books Health Promotion Alliances: Theory and Practice (1998); Health Promotion: Professional Perspectives (1996; 2001 2nd edn); Promoting Health: Global Perspectives (2005); Health Promoting Practice: The Contribution of Nurses and Allied Health Professionals (2005); Public Health: Social Context and Action (2007); Promoting Health: A Practical Guide (2010); Health Promotion for Health Practitioners (2010); Health Promotion Settings: Principles and Practice (2012). Her research is centred on the relationship between health promotion policy and practice within specific contexts. She is a member of the International Union of Health Promotion and Education (IUHPE), is President Elect for the Institute of Health Promotion and Education (IHPE) and is a Fellow of the Royal Society for Public Health (RSPH).